Why trying to understand everything is a waste of time. 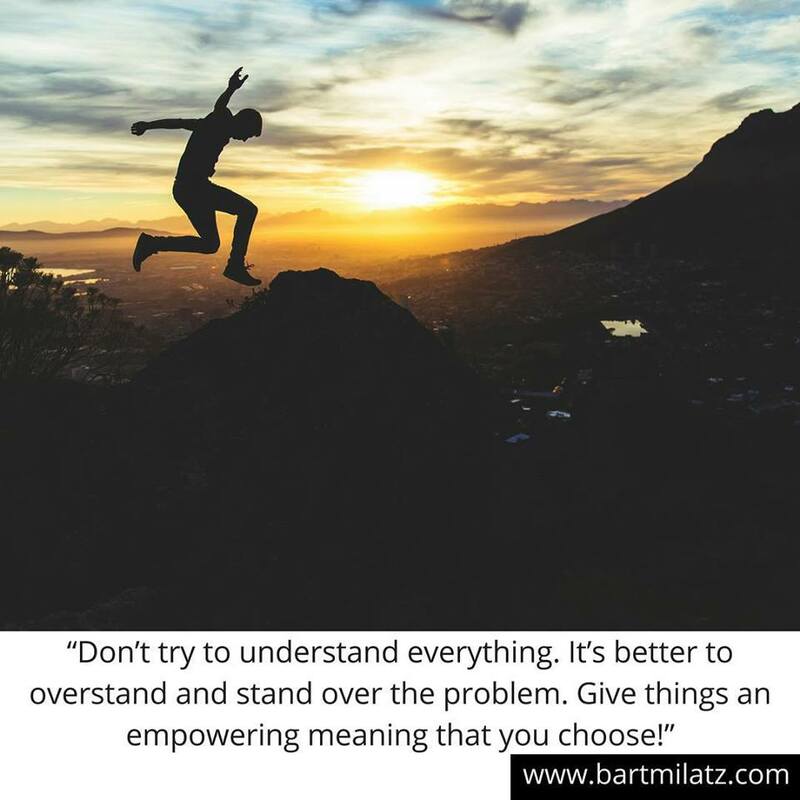 This week’s article is about understanding. Throughout my life I wanted to understand everything that happened to me, from the good stuff to the bad stuff. The more I tried to understand something, the more confused I became. I came to the realization that trying to understand everything is futile. Trying to understand all problems and people is also impossible, especially if you try to understand other people and their actions. Since you never know 100% of the details of a problem you will never fully understand why something happened. Moreover, you can never know someone’s full life experience and hence you will never know exactly why someone makes a certain decision or is involved in certain conflicts. So what is better than trying to understand everyone and everything? Here are 3 strategies that you can use in your life instead of understanding. The first strategy is not trying to understand situations, but to overstand them. Think about it: if you look at the word ‘understanding’ literally: It means to stand under the problem. When you stand under a problem you let the problem be bigger than yourself. In a way the problem or situation is crushing you. You also have a limited view because you look up to the problem, instead of seeing another perspective. When you overstand the problem you are bigger than the problem and you look down at the problem. You make the problem smaller than who you are, which gives you power to solve the issues much quicker and better. You have a broader view and don’t let the problem crush you. The second strategy is to see the bigger picture. Does the problem really matter 10 years from now? Is it really that important to know everything? Say to yourself: even this shall pass. Everything is on the way and not in the way. Step 3 – What do you want it to mean? And the third strategy is to frame understanding differently. Whenever you want to understand something, what do you want it to mean? When you want to understand something, you’re looking for reasons and explanations. How about coming up with those by yourself? You probably heard of the saying: everything happens for a reason. What reason do YOU want things to be happening for? If you give situations empowering meanings, it will put you in charge and in control, instead of being dependent on external factors. I hope you enjoyed this week’s blog post. Now I would love to hear from you! What can you do to better OVERstand situations, people and circumstances? Please leave your comments in the comment section below. Do not necessary to Understand everyone on earth Do you have a good friend in front of you? Time may not be reversed. We do not waste time With people who have never seen us important.